ScanChex specializes in giving its subscribers an inexpensive & easy to implement means to get Independent Verification that your important assets and other critical items are being checked by your designated employees at the right time and at the right location. When last was the generator checked, and by whom? Was the store opened up on time for business? Did the restocking clerk miss one of the vending machines? Were all four sides of a vacant house checked or just the front? Were my pets fed on time while I was away on vacation? Service maintenance companies could monitor their field technicians, helping to ensure that they are showing up for appointments on a timely basis, and alerting both management and their customers of any potential delays via emails or text messaging, helping to protect and enhance the company’s reputation tardy in carrying it out, and because each tag is geo-coded it must be scanned from the pre-established location. ScanChex is a perfect solution to help healthcare providers ensure that patient visits are scheduled and maintained on a timely basis, providing independent verification to satisfy compliance protocols for all levels of care, mitigating audits for improper questionable practices. In Agribusiness, where management can receive independent verification that critical operations are being carried out by all levels of staff on a timely basis, thus enhancing productivity. ScanChex also provides a variety of management reports ranging from missed scan notifications, packing slips, employee schedules to employee speeding advisories, just to name a few. ScanChex is a subscription, cloud based ‘Software as a Service’ which means that there is no software to download, and you can access the platform anywhere there is an internet connection. Additionally, ScanChex is designed to be up and running in a matter of minutes without the need for specialized equipment and utilizes everyday smart phones as the scanning device. After three years in development, and having employed the highest standards of programming and security, you can be assured that our services are constantly being improved as the company rolls out new features and improvements, always staying on the cutting edge of the latest technological advances. ScanChex, Inc is based in Miami, Florida, United States. The ScanChex smart phone application (“App”) is currently available for on both the Android and iPhone platforms, and can be downloaded from the Google Play Store and Apple’s iTunes respectively. Any versions lower than 7.0 might have some errors in the GPRS mapping system. Provides inspection services for banks and others to ensure that empty foreclosed homes are not being occupied or otherwise being vandalized. To avail the services of ScanChex, every customer is required to register, and we do offer a FREE 15 Days trial account to explore our services – this time period will help ensure that ScanChex is right for your business and your assigned account executive will help you configure and implement a proper trial along with goals within a limited area of your operation (please see our suggested Trial Period Guidelines which will help you during this time. Click on the “Learn more” link to view a briefly video explaining what ScanChex is all about. Already explored the options? Click on the “TRY it FREE!” link to sign up today and enjoy 15 days free of charge. Complete the registration form with correct information. The email address given should be up-to-date, as the confirmation email will be sent to you there, along with your account number and temporary password (which you will be able to change once you log in). All entries with * are mandatory. Check out the Monthly Packages that ScanChex offers chose the one that fits your business the best. Read the Term and Conditions that apply before you register. Select the Check box to agree with the terms and conditions. Registration is complete. Kindly check the email that you have provided to obtain your account number and for temporary login details. You will need to change this temporary password once you log in. Check for an email from ScanChex, confirming your Registration. Kindly check your Junk Folder and authorize emails from ScanChex to land in your Inbox. Open the email for your login details. The email received from ScanChex contains your Login details. A unique Customer ID is assigned to you by ScanChex, which both you and your employees will need as part of your login credentials. 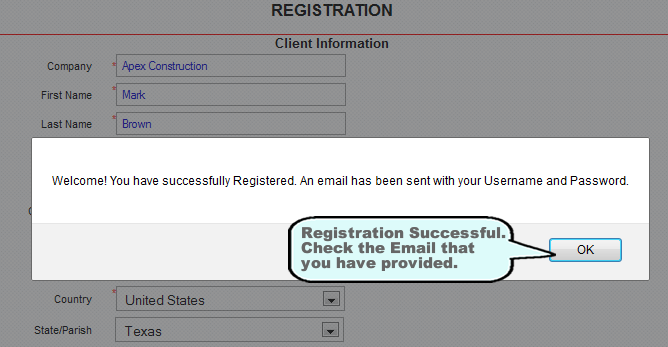 Username is the same as you entered in your registration form. Your password is auto-generated by ScanChex. You can change it once you login for the first time. Click on the link “Log in here” in your email. This will redirect to you login page on scanchex.net. Type your Customer ID which you received in your confirmation email. Type your Username that you have provided at the time of registration. Type your Password form the confirmation email. Click on Sign In button to Login your Account. Each user (Administrator, Supervisor or Employee) will each have their own password, but will need the Company ID to be able to log in. Your password is changed – write it down carefully and safely so you won’t forget it! Check your Email for the new Log in details for your account. 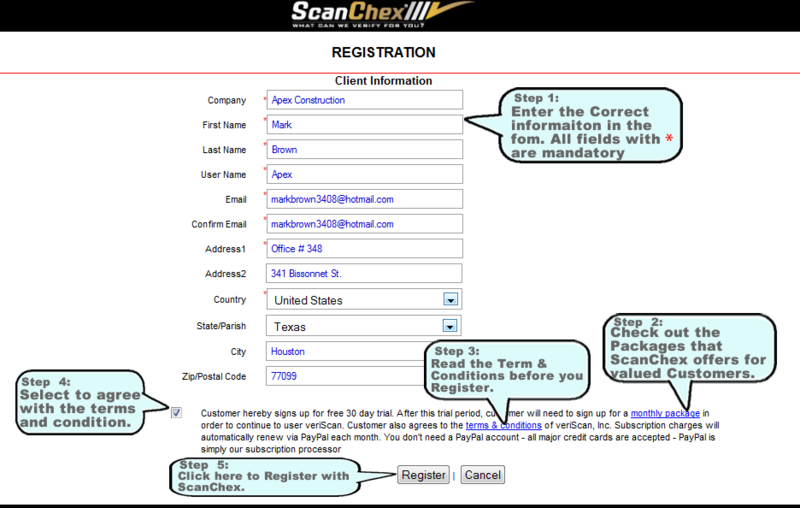 Use the Customer ID, Username and new temporary password to log in to your ScanChex Account. You can change your password to your desired one by going to the “Utilities Tab” and click on “Password Change”. Once logged in, you can logout from your account by clicking on the Green “Log out”button on the top left. This will end your session immediately and automatically re-display the main “Log In” screen, where you can log in again, should you wish. Any completed work you have done will be saved automatically once you are logged out. Various ‘tab’s which become ‘active’ once a ticket has been selected in the ticket panel. Color coded tickets on dates due. Additionally, there is a “MESSAGES” button at the very top which is where you can send a message to any or all of your employees instantly and from them directly to you. An alert symbol contain the number of unread messages will be show beside it, if this is the case. The top band also contains the menu items in addition to the other short cut buttons: CONTROL PANEL, MESSAGES, TICKETS, LOG OUT. Your name and current time (at your logged in location) is also shown. The website Interface will give you access to Add / Edit / Delete your Employees, Components, Services, Customers, Profile, Tickets and your Assets. You can manage your View / Edit / Print your QR codes, Reports and Employees performance. You can upload the Requirements, Questions, Documentations, Videos and audios that are required for your employees to carry out the efficient work in minimum amount of time. The Website interface will give you full command over all your business modules, including to ability to send messages to any or all of your employees instantly and update their work priorities. Here a glance of the main control panel of your ScanChex Account. Reports provides you will all the reports necessary for keeping track and records of your business. Utilities provides you with backup & restore, import and export utilities. Help provides access to this Help Guide in addition to how to get support as well as a place where you can report issues and even request feature you think would be beneficial to all users. In fact, in keeping with the above, the system will guide you through these steps,the first time of you log in (after you have changed your password from the temporary one). The screenshot below shows the employee panel containing your own information. A server message is displayed on the top of the panel reminding you that you need to add at least one employee. Note that your information is already added for you here as the “Administrator”, shown as “Admin” under the “Level” column. The “Control Panel”tab will guide you to your Control panel where you can see all the current activities, add and assign tickets, etc. The “Add Ticket” tab allows you to add tickets any time you want. These will be described in greater detail later in this guide. Finally, on the top right of the side, the current time according to your time zone is displayed. The Profile settings are very important in that it contains the information that will reflect on almost every section of your account. In updating your profile, you will upload your logos, default settings, create and maintain your documents library, default questions for your employees, and many more. Updating is very important as you information will reflect on your statements, reports, employee cards etc. Here is a step by step guide to update your Profile settings. 1. Open the Maintain tab and click on Profile link. 2. You can upgrade your monthly package by clicking on the upgrade link and select the package best suited for your business. You can subscribe for your monthly package instantly. See the Monthly package payment option for more details. 3. Assets added to your account are summarized and compared against the package you have subscribed for, leaving the amount available– show in a separate line. 4. You can also cancel your account when you click on the cancel link on your profile page. Confirm your selection if you are sure you want to cancel your account permanently. 5. Click on the Questions Tab on the top of your Profile panel to enter the Questions that you require your employees to answer before the start a job. These questions can be any, like ask your employees if they carry all the tools with them before leaving for the service of the asset. QUESTIONS allow you to create a series of default questions which may be common to the assets that you create and which can then be selected from, as you create these assets. Once you enter these ‘default’ questions within your profile, you may then select from among them when you create your assets. In this way, any ticket created for this asset, will now have these questions WHICH MUST BE ANSWERED BY THE EMPLOYEE BEFORE HE/SHE WILL BE ALLOWED TO CLOSE THE TICKET OUT. Please note that you do have the ability to create “Custom” questions at the asset level, specific to the asset (in addition to the ‘default’ questions). 6. Click on Add button to start adding your Questions into to your profile. 7. Write the Questions in the Question section and choose the type of answer for the question that your employee has to submit. 8. There are 3 types of answer choices available. 9. Save the answer of the questions. 10. You can update these questions and their answers any time you want by clicking on Update button in the end of each question. You can also add more questions. 11. The next step is to add the documents. After adding documents, you will then have access to them as you create each asset, from which you select the ones relevant to that particular asset. Please note that you do have the ability to create “Custom” documents at the asset level, specific to the asset (in addition to the ‘default’ documents). 12. Click on the Documents tab and then add. Your Employees can read these documents anytime through their devices at the time of need. These documents can be your rule or guide book, manuals or anything which might help your employees to perform best. 13. Select the Document you want to upload by clicking on the Choose File button. Navigate to where the file is located on your computer and then click upload to upload the document. 14. The documents will appear in your Document panel where you can Edit or delete them. Select whether or not notifications are sent upon Ticket Creation, a ticket being rescheduled or when the employee is on his way. Enter the email of your company officials who will receive the alert notifications on various ticket statuses. ScanChex is a ‘ticket’ driven system, and you can use your own initial number when you first start. This number is completely arbitrary and is up to you to decide – what some customers do is to base this on their existing ticket numbers, such as using skipping the current sequence and then starting with the next higher set in round numbers, in such a way as to be able to tell immediately which numbers were generated by ScanChex. This is the ‘default’ time you wish to have on each ticket that you will allows for ‘INSPECTION” type assets to be inspected. For example, if your employee commonly inspects, say empty foreclosed homes, you may wish that this default time be set to 5 minutes per inspection tag or checkpoint. This is used to help determine the total job time for this particular ticket, and this can be modified from one ticket to the next as needed. This is the average time you wish to allow between one location and the next. All screens, reports etc will reflect this chosen format.. You can freely change any time for your account. As part of our commitment to the security of your files, ScanChex allows you to encrypt your data using a key only known to you, and this is where you can create this key. From time to time it becomes necessary to cancel tickets which have been created. In cancelling these tickets, ScanChex will prompt you to enter a reason and any comments you may wish to add. The default reasons you may wish to choose from can be entered here for easy application. There are 5 default emails available to be alerted to the various messages being sent from time to time. Additionally each can be individually selected to receive “Alert on Exception” or “On Scan”. If used, this logo needs to be a maximum of 225 x 35 pixels as shown, for best fitting. Please enter the company logo here that will print out on you employee’s ID cards. For best results, use a size of 385 x 215 pixels. Once again, if your account package is greater at least a 100QR or greater, you will have the ability of including a private label logo within each QR tag as they are printed to enhance your company’s brand. For best results, use a size of 50 x 50 pixels. If your account allows it, and if used, you will see a sample tag generated to help you refine the tags label and also to make sure that it scans OK.
Click Save to save the changes you made in to profile settings. The first Step you are required to perform is to add employees for your company. In this section you can Add / Edit / Delete your employees and assign username and password. The username and password is required by the employee to login to the application on their mobile devices. Once logged in successfully, they are able to perform their required tasks according to the services set on each ticket by the manager / administrator. Following is a step by step guide to demonstrate how to add and modify an employee. 1. Click on the Maintain Tab and click “Employee”. Or if the window is already being displayed, click on the Add button to start adding your company Employees. 2. Enter your Employee’s First Name, Last Name, and Email ID. The Manager level employees have full access to the entire scanchex.net ‘back-end’ to administer the system and perform any function such as adding tickets, customers, assets run reports etc. Managers and Supervisor level employees have access to a special administration panel of the mobile application where they can perform certain functions such as the ability to take new asset pictures and pin-point its physical location more accurately. The Employee Level represents your mobile workforce., responsible for actually doing the work as contained on each ticket. 4. Choose the status of your Employee. If the employee is available to work set this to Active. If an employee is not working with your company in this position again, set this status to Inactive. Employees cannot be deleted as such, they can only be de-activated. 5. Enter the Username and Password for the Employee. This Username and Password will be used by the employee to login to their devices to carry out their assigned tasks. 6. The Username and the Email of all Employees should be unique as the system will verify if either Username or Email ID of any employee matches with any others, within your organization. 7. Upload the Picture of the Employee. The picture option is used for making the Employee Cards for their verification purposes, and for the best resolution you should make the size 300×300 pixels / dpi. 8. Click on “Save and Add New” button on the bottom of the page to add a new Employee of your company. 9. All the Employees of your company are shown in your Employee Panel where you can see their information and Add/Edit/Delete your Employees. 10. To Edit / Update and Employee, simply double click on the name of the employee you wished to update and or click on “Edit” button on top of the panel, after selecting the employee first. 11. Update the information of your employee. The username and password can also be updated. Click save when you finish updating the current employee. 12. To print the Employee Card simply click on the name of the employee in the Employee panel and click the button Edit. In the Update User page you will see a button on the button of the page “Print ID”. Click on Print ID. There is a QR tag but it has been damaged in some way, and is not adequately scan-able. There is also an area for you to add your company’s logo which is needed for your employees ID card.For the best resolution this image needs to be. This is added under your company’s profile. The ScanChex logo appears on the ID card for accounts under 100 codes. Any account over this is able to add another logo in substitute (under the Profile settings area). 14. To Delete an Employee you need to go to your Employee Panel. Select the Employee you which to delete and click on the Delete Button next to Add / Edit. 15. This will permanently delete your Employee from the system. The system will reconfirm before deleting any employee as to be sure whether the button is clicked by mistake or not. If the employee you are trying to delete or otherwise make inactive, has Tickets assigned to him or her, these tickets will move to be “Un-Assigned” status so you can assign to your other employees. ScanChex is ‘customer based’ and you can add as many customers as you want, depending on your monthly package. Your customers may be located anywhere in the world and each will have a designated time zone. Following is a step by step guide to help you create your customers properly. 1. Open the Maintain tab and click on the Customer link. 2. You will see a summary customer panel, which will list any previously entered customers. To add a new customer, click on Add button on the top of your panel. 3. Enter the complete customer’s details. Note that the longitude and latitude fields are automatically created. 4. You can enter multiple addresses for the same customer. You can enter different managers for each location with their email and telephone numbers. All this information is required for your employee to reach on the specific location and for payment options. 5. The interactive map will pin-point your customer’s location visually. 6. Click Save and Add new to add more customers. 7. The information will be saved in your account. Click OK to add the next customer. 8. You can Add you customers later also by clicking the add button on the top of your panel. 9. If you wish to Edit / Update some specific customer information select the customer from the summary panel and click the Edit button. This will allow you to make changes to that customer’s information. Click save in the end to confirm the changes. 10. If you want to delete any customer form your system, you can select the customer form your panel, click on delete button on the top of the panel. The server will confirm and your selection. Your customer will be deleted from your account. If there are any active tickets pending on the customer’s account, you will be notified. As shown below the components A .. Z are what comprises Service #123. Services are placed on your tickets for your employees to perform, and you have the ability to print a packing slip for so that you can be sure the employee takes the correct components (and quantity) to ensure that the work is done efficiently, without back and forth to the office to get the parts needed. Additionally, you can track your component costs, and also assign a retail value for your customers. As your employee works through a ticket, they check off each service as it is completed, so you are able to keep track of the progress they are making. You can have as many services as your company needs, and each can be comprised of as many components or parts as required. This section is intended to guide you through the procedures to set up the components and services needed by your company. To maintain your components (Add, Edit, Delete), simply select “Components” from the Maintain menu. 1. Select the Maintain menu and click on “Components”. 2. You will see the Components Panel. Click on the Add button on the top of the panel to add your first component. 3. Enter the Component ID, Description of the component, Cost and Retail of the item and the Supplier. The Component ID should be unique and not match any other component ID used before. 4. After Adding all the information for the component, click Save and Add New to add the next component. 5. After adding all the components, you can see those components in the summary panel with the description of each component. 6. The components panel also stores the information regarding the Last Use, Last use by and total component used to Date. You will find this information useful by helping you to keep track of how many components are used and in how much quantity. 7. Once you add components to your service you will see the service that uses that specific component. Choose the service for each component. All the components will reflect in your services. If any of the components are required for the asset you can choose when you generate the ticket. 9. If you wish to Edit / Update some specific component information select the component from the summary panel and click the Edit button. This will allow you to make changes to that component’s information. Click save in the end to confirm the changes. 10. If you want to delete any component form your system, you can select the component form your panel, click on delete button on the top of the panel. The server will confirm and your selection. Your component will be deleted from your account. If there are any active tickets pending using the component, you will be notified. Services are where you record all the service that you provide for your customers. You can populate your services and add the components that make up or comprise this each particular service. 1. Open the Maintain tab and click on the services link. 2. You will see the summary Service’s panel. Click on Add button to start adding services. 3. Enter your Service Code, Description and Default Estimated time. The Service Code should be unique and not match any other assigned code. Estimated Time is the average time you expect an average employee to be able to complete this time once they start working. ScanChex uses this time to help you total the average time that a specific ticket will take to complete. 4. Choose the components that are related to the service. 5. Enter the Quantity of the component. 6. Click Save and Add New Service to add the next service that your company provides. 7. The Service is added to your account. Click OK to add the next service. 8. Once you finish adding all the services, you can see them populated in the summary Service Panel. 9. In the Service Panel you will see the Components on the right hand side. The Components are shown in the drop down menu. The last option in drop down menu is add more components. You can easily add more components in your service by clicking on “Add More”. 10. By clicking on the Add more you will see the list of components you have already added in your Components section. You can choose the desired components that you need to add to this particular service by clicking the check box. Enter the Quantity of the Components that are required for the service. Click “Save” and the new components are added to your service. 11. To Edit / Update Services, select the service, click on the Edit tab on the top of your Services Panel. 12. After updating the service, click Save to save the changes. 13. You can delete any service you desire at any time you want. If that service is currently used on a ticket, the system will inform you that it is currently active. Select a service that you wish to delete, click the Delete button on the top of your service panel. Confirm your selection to be deleted. 14. Your service is deleted from the system. The components that were a part of the service will be updated automatically. This Section of ScanChex will help you in populating your assets. ScanChex uses term to include any item, person or pet. In this scenario, an Inspection type asset would be created and assigned a frequency of inspection, ranging from hourly to years. A QR code is printed, which is placed on the asset. You also have the ability to create a series of ‘checkpoints’ at this particular location, which, when set up will need to be scanned by the employee as part of his duties. The next step is to assign this job to one of your employees, and using our accompanying mobile app, he or she will scan the code(s) or checkpoints, at the appointed time. This work appear as ‘tickets’ on the employees device when they log in … these tickets are generated automatically by the ScanChex server several hours on advance of the actual time. If your employee does not scan the code at the correct time, or location, an alert email is sent to designated individuals. ScanChex is also designed to ensure that the correct employee is doing the work, and there are safeguards to ensure that it cannot be inspected outside a limited window of time. You will need at least 1 QR tag for each asset or location, however each tag can have at least 5 checkpoints. The system works much the same as with Inspections, described above. Assets are created, but as a ‘SERVICE’ type asset. A QR Tag is created to be placed on the asset, for example and A/c unit in a hotel room. Employees need not be assigned at the point of creation, and can be done any time the ticket is created. A frequency can be established for preventative maintenance reason to help ensure that the work is being performed when it should. Additionally, each ticket can have all the services required to be carried out by the employee included so they will know exactly what needs to be done. Before they leave your offices, they can print out the components or parts required to complete the associated service properly. While they’re on the job, they can fully document the visit by making notes in whatever form they wish such as written, voice, pictures or even videos. They will also have access to any documentation such as schematics or configuration manuals etcand, as well, the prior ticket history and associated notes performed by others. While the asset is being serviced, the manager can see this progression and any notes recorded, via the Control Panel. This works exactly the same as SERVICES described above, however, the ‘assets’ in this case is referred to as ‘Patients’, and is fully HIPPA compliant. This is useful for ensuring that your employees get to work and leave on time. If you do not, then an alert email or text message may be sent to you. An advance calendaring system supports changes in specific days, such as when they’ll be late because of a doctor’s appointment. Holidays are also supported (internal plus public). You will need 1 QR tag for each employee, and here again, checkpoints are not applicable. If you have important and valuable equipment that you want to be able to monitor as to which employee has it, for how long, and to be alerted if it is not being returned on time, then utilize our Check-In / Check-Out asset type. This allows you to assign QR tag to the asset, and then use the mobile app to check it out to a specific employee, for a specific amount of time. If it’s not returned on time you will be alerted. You will need 1 QR tag for each asset. This is being finalized, but will work similarly to the HEALTHCARE asset type, but for ensuring that your pets are being looked after by the correct individual and on time. This service will also support geo-fencing. This will be launched within the next few months. Tracking when children are picked up by their school buses. If the child did not catch the bus for any reason, you will be notified instantly. Or if the elderly is not being picked up on time. ScanChex ENTRÉE can also be used to check off tickets at a concert to help ensure tickets are not being duplicated fraudulently or in a amusement park to help ensure that the number of rides paid for is not being exceeded. Company ID, Create Date and Assigned Asset ID are all automatically created. In this step you will add the type of the asset you want to create and enter the details of the customer. Most of the details of the customer will populate automatically. Enter emails of the officials of your company who wish to receive exception and other alert notification emails concerning the asset. You can upload the image of the asset by clicking on the image tab. Click on Save and Add New to add next asset. You can print ,as well as email the QR code to your employee or customer by clicking on Print or Email button at the bottom of QR code. Click on Save button to save the asset.